I've had these models for awhile now, having picked up some old metal ones off of eBay. I had been continuously putting them off since they didn't seem like they would be the most fun to paint. With the AoS Singles Tournament at Adepticon looming though, it finally gave me the motivation I needed to get these guys finished. 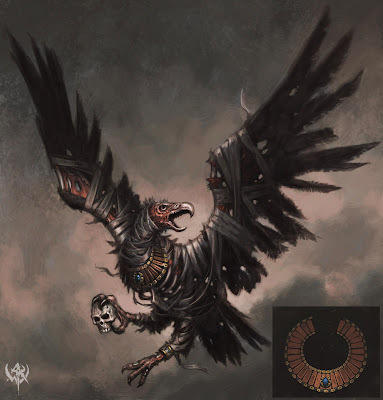 I really love some of the artwork in the old 8th edition Army Book for the Carrion. In my opinion, they look much more fitting for a Tomb King force then the current models do. There is one piece in particular I like, a giant battle scene against some Brettonians, in which you can see a Carrion on the left hand side and it's wearing a very Tomb King-esque head dress. 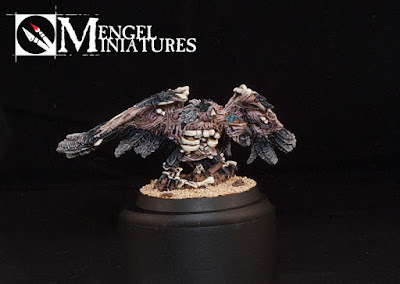 This was my direct inspiration for converting the models. There is also a pretty cool piece of concept art from the old Warhammer MMO that has a similar sort of idea, which you can see above. I actually converted the first one months ago. 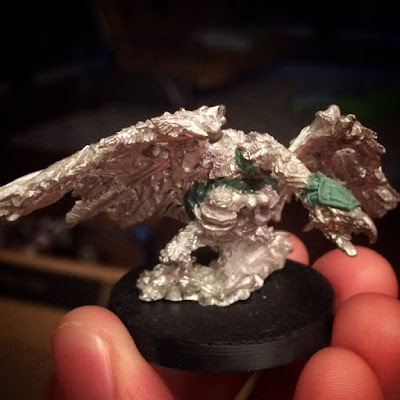 I had been working on something else and had spare greenstuff left over, so instead of letting it go to waste I gave sculpting the headdress on one of the birds a shot. It's not a direct copy of the artwork, and actually owes more to the Ushabti with Great Bows head pieces then anything else, but I was pretty happy with it. It was quick, simple, and captured the Egyptian feel. Fast forward to about a month ago and I picked the unit back up to finish the other two. I didn't want to do the same thing on all of them, so I gave one of them a collar similar to the one worn by the Tomb Guard. This actually turned out to be my favorite of the three, and in my head he's the alpha-Carrion. The last one I left as is, just filling the gaps between where the wing pieces meet the chest. This was partly due to just wanting to get on with painting them, and also partly due to putting some variety in the unit. I figured having one stock model would be okay, and that way they aren't all fancy. I knew I didn't want to spend a ton of time on these guys. My Tomb Kings are unique amongst my armies, in that I actually force myself to not spend a ton of time on each unit. They are also my army with the highest model count, so that may have factored into the decision. The only stuff I spend a lot of time on are constructs like the Ushabti, characters, and other center piece models. 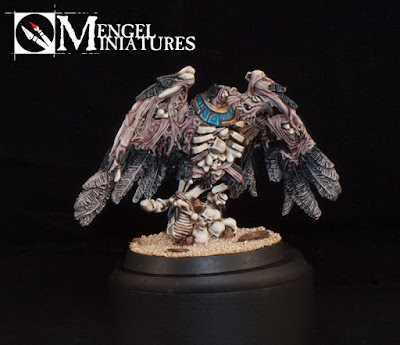 Having said that, when I first started the army back in 2011ish, I was really just drybrushing the skeletons. The most recent skeletons I have painted for the army, my archers and a single chariot, have had the pure drybrushing swapped out for a drybrushing/layering combo. My desire for neatness just won't allow the drybrushed look on flat surfaces anymore. 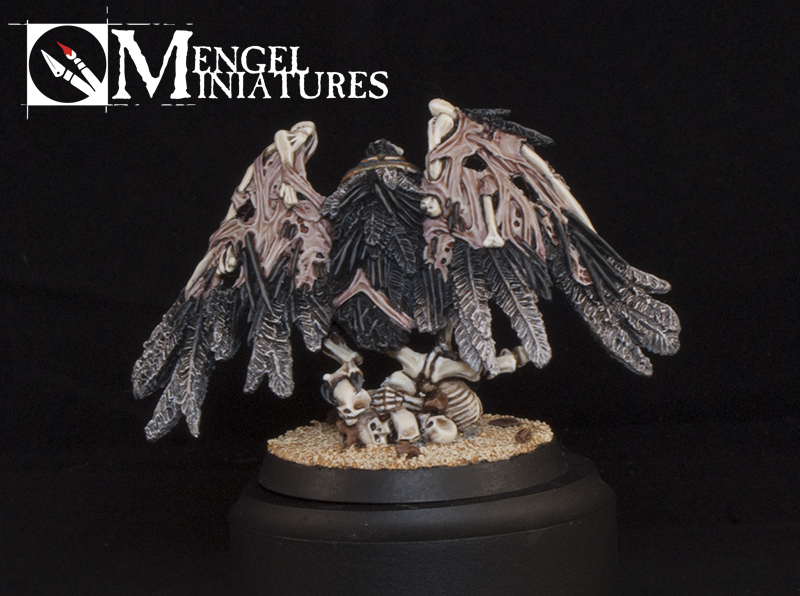 The Carrion though were mostly feathers, so I was perfectly fine with just drybrushing the bulk of them. They were all primed black, and then given a thin coat of Abaddon Black paint. This was drybrushed with Eshin Grey, followed by Dawnstone Grey, and lastly Administratum Grey. I focused more and more on the tips of the feathers and other prominent features with each new layer. With that the feathers were done for the moment. The next largest area was the weird skin all over them. I still have no clue what the sculptor was going for with this. Some of the skin looks like the Carrion's own, decaying skin. While other areas of it look like a weird gooey skin thing stretched over top of it. It's almost like bandages, but not since they are too wide and skin like for that. In my opinion these minis would have looked a lot better if those parts had been sculpted as bandages. 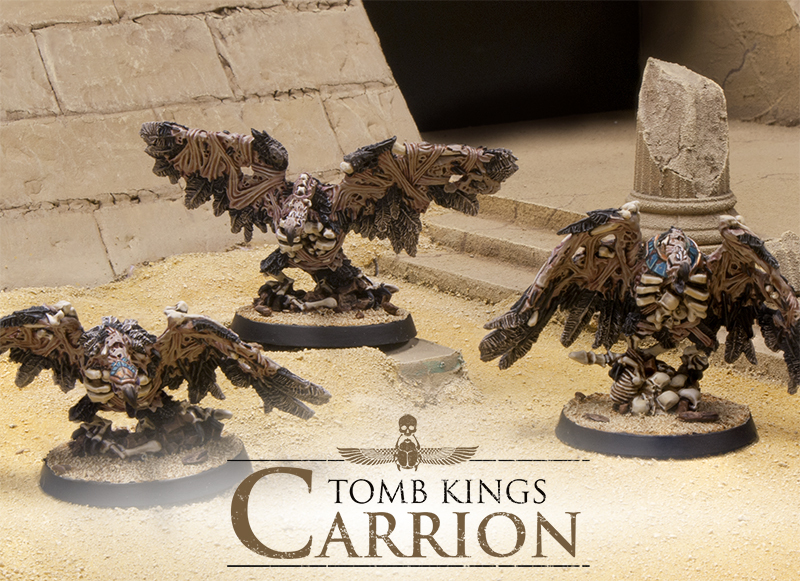 They are a little too fresh for the barren and dry Tomb King look. They are almost like zombie vultures, instead of mummy vultures. 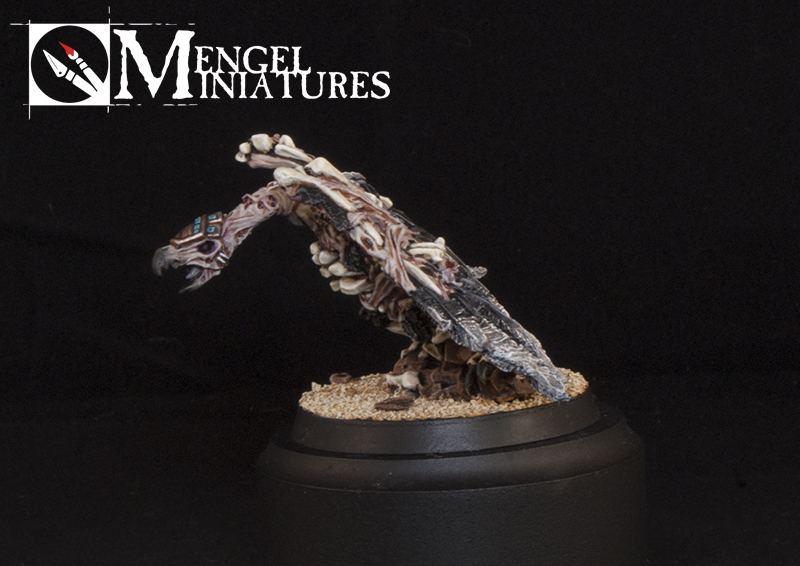 All of the skin areas were basecoated with Rakarth Flesh and washed with Reikland Fleshshade. This then was re-layered with Rakarth and highlighted with a Rakarth/White mix. I wanted to go for a pallid look to contrast with the black feathers. It's a pretty simple recipe but takes a little time since there is no drybrushing and you have to just follow all of the many contours with your brush. Next up was all of the bone was tackled. It all got a base coat of Rakarth Flesh to give the bone a lighter color to paint over. I also found a few ares of skin I had missed in the previous step while doing this, and made sure to paint them at the same time. 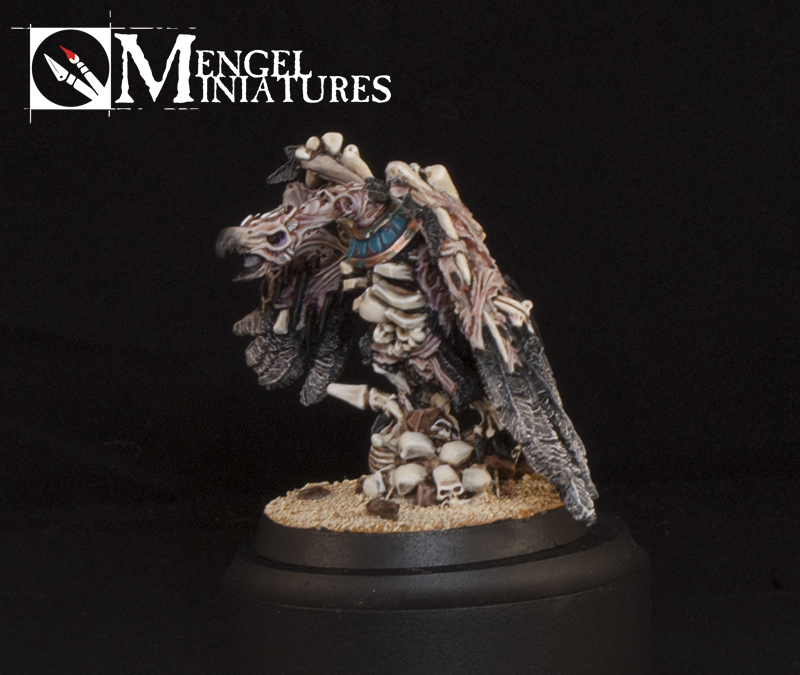 All of the bone then got a solid coat of Screaming Skull, followed by a wash of Agrax Earthshade. 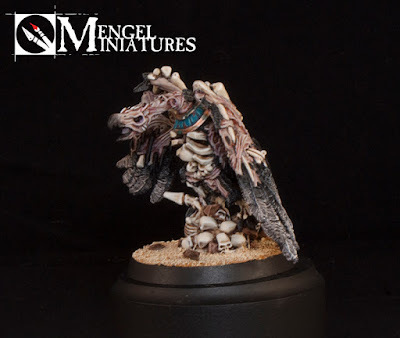 I then re-layered the Screaming Skull on top and highlights in two stages with a Screaming Skull/White mix and a final edge highlight of pure white. 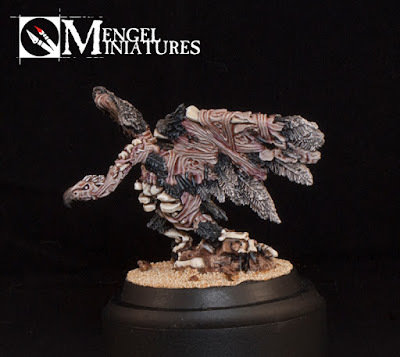 After this step I decided there wasn't enough contrast between the skin and bone, so I used some Carroburg Crimson wash to lightly glaze the areas where the skin was torn or stretched to give it a raw look. 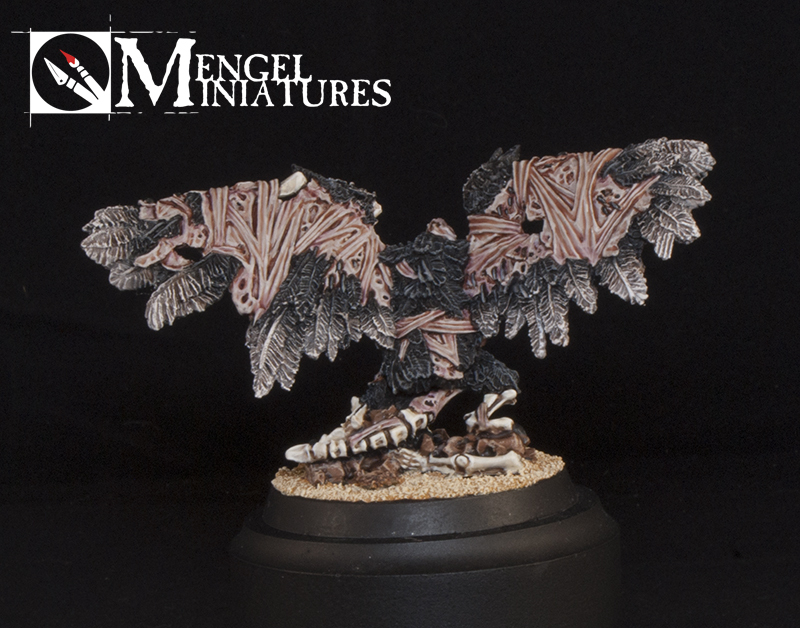 I also decided to add a two-tone look to the feathers to make them more interesting. I have a brief tutorial on this coming out next week, so keep an eye out for that. Now all that was left were the various small bits of other color scattered around. I cleaned any mistakes up, gave the eye sockets a wash of purple (I still have Leviathan Purple), painted the eyes white for that milky eye look and then finished with the beaks. 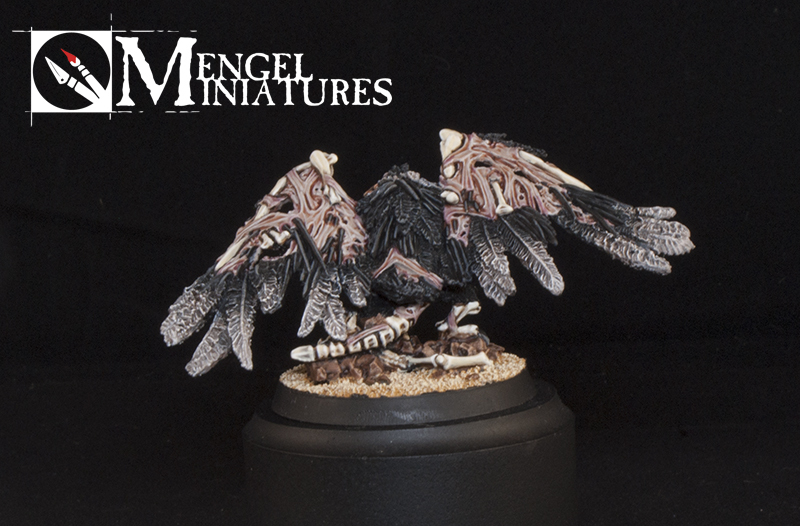 For these I used successive washes of Nuln Oil, focusing more and more on the tip of the beak to get a smooth transition. The two with bits of armor had the blue painted with Temple Guard Blue and shaded with Stegadon Green. These were highlighted with a Temple Guard Blue/Screaming Skull mix, and the chipping was added on with Doombull Brown. The gold was base coated with Retributor Armor and then got a solid layer of Gehenna's Gold to match the rest of my Tomb Kings. 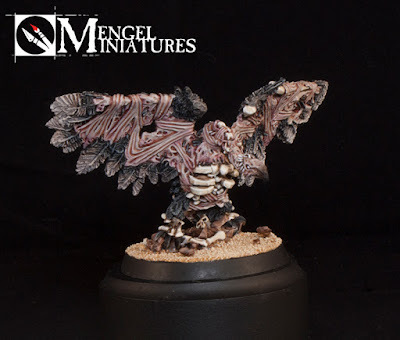 This was washed with Agrax then re-layered with Gehenna's before getting a final highlight of a Gehenna's/Runefang Steel mix. With all of the done I based them like the rest of my army, made sure they had a nice thick coating of Matte Varnish to protect the metal from chipping, and they were done! Be sure to watch the video below for a 360 degree video of the model. The music is once again provided by Adam Harvey, you can follow him on his Facebook page and listen to some more of his music on his Youtube channel. You can vote for them on Cool Mini or Not here.